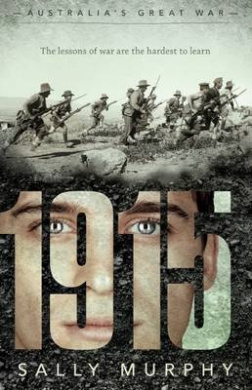 Today is the release day for my new book: 1915. So, I thought I’d celebrate by asking myself the same 10 questions I usually as visiting authors. They say talking to yourself is the first sign of madness – but hey, you have to be a bit crazy to be a children’s author, so I’m fine with that. 1915, published by Scholastic Australia, on February 1. Usually I write a book because there’s an idea that won’t leave me alone. This time was a little different – because I was approached by Claire Hallifax at Scholastic to see if I might be interested in writing for this series (Australia’s Great War). I love a challenge, so I said yes. My brief was to create a fictional story set in the midst of Australia’s involvement in World War 1 in the year 1915 (other books in the series deal with the other years of the war). It was up to me to find a way to bring those events to life, through a character young readers could connect with. I decided on a school teacher, because I was interested in how the war affected children back home, and I thought perhaps having a teacher at the war would connect a class of children more closely. One day I was looking at the very famous photo of the 11th Battalion posed on the Cheops pyramid, and I realised I had a starting point for my story. My character, Stanley, was there posing for a photograph. I started writing, and found that having him there on that pyramid really got me into Stanley’s head ready to tell his story. Finding a way to explore really difficult events in a way that is both realistic but also appealing to children. I cried writing this book, many times, but needed to be sure to somehow offer hope. The other difficult things is fictionalising history. It is important not to alter facts too much though occasionally some poetic license is needed. For example, there are a few characters in the book who were real people. In order to write about Charles Bean, the war correspondent. I had him befriend Stanley, and get Stanley’s help on compiling the Anzac Book. This didn’t happen, of course, because Stanley is fictional. So it was important to do this only when and as necessary for the story to come alive, but not to alter what really happened. My name on the cover? Seriously, though, I think the fact that it highlights the creation of The Anzac Book is pretty cool, and the photo on the pyramid too. It’s good to be able to bring pieces of history alive. That a deadline is a pretty good way to overcome self doubt. I had never written historical fiction of his length before – and kept wondering if I could really do it. But the contract had been signed, and there were deadlines, so I had to get over that and just work work work till I got it right. My editor, Claire, was a great support. I also learnt many many things about the Gallipoli campaign, about war, about some of the famous and less famous men and women who served, and about life back at home at the time. I’ll be visiting lots of blogs, and talking at schools and festivals throughout the year, as well as my usual twitter, facebook and so on. And telling anyone who will listen! Lots of things. I’m currently a PhD candidate, with my project focussing on children’s poetry. As part of this I am working on a verse novel and a collection of poetry. I’ve also got a new picture book, Fly In Fly Out Dad, coming out later in the year. I’ll post links to any other interviews and publicity on one or all of these. Oh, and today I’m having a virtual launch over on my blog. Drop by and join in the fun, If you leave a comment you will be in the draw for a free copy of the book. And, of course, you can buy the book through good brick and mortar bookstores, or online. Delighted today to welcome Ambelin Kwaymullina to the blog to chat about her latest book, the second in the Tribe series. Over to you, Ambelin. The Disappearance of Ember Crow, Walker Books, released 1 November 2013. The same reason I write any of my books. Because I have to. In the times when I do not write the stories build up and up beneath my skin; they begin to whisper in my ear and demand to be told. If I do not write I fear I will explode. Or possibly go crazy. About a year, all in. I feel what my characters feel when I am writing; that makes the tough moments for them even tougher to write for me. That’s not a particularly dramatic moment, but it was difficult to write because I was conscious when I was doing so of how very vulnerable Ember is. She’s hiding what she feels from Jules at this point; she doesn’t believe it’s possible for him – or for anyone – to truly care about her. I felt so sad for her, my Em; I could feel her isolation, there on the road in the dark. The big revelation moments – and I can’t say anything about them without giving something away! But there’s lots of ‘wow I didn’t see that coming!’ or ‘I can’t believe it!’ moments in Ember Crow. Scrabble tournament with my family. It was a draw between me and my brother Blaze. Well – this blog tour, for a start! And I’m in the process of putting my own author website together which is very exciting. If there’s any fans out there who are reading this, once my website is done you’ll be able to go onto it and work out what animal you’d be bonded with in the Firstwood. Pretty cool, huh? (I think it is anyway). Third book in the Tribe series – The Foretelling of Georgie Spider.